MacBooks have been the laptops of choice for digital artists since forever, but a new generation of Windows laptops are trying to convince talented professionals and amateurs alike to change their allegiances. The Dell XPS 15 9570 is one such laptop. The hardware is not only powerful, but Microsoft has updated Windows 10 with a number of different “Creator’s Edition” updates, which are intended to bring better tools and functionality for artists and video editors alike. That said, the differences between macOS and Windows 10 — or the MacBook Pro vs Dell XPS 15 — might not be immediately clear. That’s why, in this article, we compare it with the most recent MacBook Pro to see which machine is better suited for video editing and other creative functions. Let’s dive right in, shall we? Apple knows how to design a great-looking laptop—no question about it. Apple’s formula is relatively simple: an aluminum unibody chassis, a high-resolution display with minimal bezels, a large trackpad, and as few distractions as possible. What separates Apple from other companies that follow a similar approach is its astonishing attention to detail. Just like all other MacBooks, the MacBook Pro is beautiful in every way, just like a laptop for digital artists should be. Perhaps because the Dell XPS 15 9570 combines aluminum chassis with a carbon fiber shell, it doesn’t look as sleek as the MacBook Pro does. Regardless, Dell has designed a lovely laptop, and did so without sacrificing any important ports. The only design quirk that you might hate about the XPS 15 is the placement of the webcam, which is located below the display, providing everyone you communicate with a clear picture of your nasal passages. That said, as far as design goes, we think Apple has really nailed it here. Dell hasn’t been able to come close to the design prowess, as the MacBook Pro has easily become a sort of “status symbol” for creators and artists alike. As is characteristic for Apple, the MacBook Pro is very light on ports. Apple believes that the USB Type-C port is all you need, which is why you get four of them, plus a headphone jack, and nothing else. Granted, the USB Type-C ports on the MacBook Pro support Thunderbolt 3, delivering up to 40Gb/s of throughput for twice the bandwidth of Thunderbolt 2 and allowing you to charge the laptop and output video through the same port, but we still think that the MacBook Pro would benefit greatly from having at least an SD card reader. However, with how versatile the USB-C ports are on the MacBook Pro, an external SD card reader can easily be hooked up, and for relatively cheap, too. The Dell XPS 15 9570 doesn’t hold back when it comes to ports — you get USB Type-A 3.0 ports, HDMI 2.0, Thunderbolt 3, and a 3.5 mm headphone jack on the left. There’s also a full-sized SD card reader on the same side. And on the right, you get one more USB 3 Type A port, a battery level indicator, and a Noble lock slot on the right. If you’re ready to live the dongle life, you might not mind the poor selection of ports on the MacBook Pro, but everyone else should lean towards the Dell XPS 15 9570 instead. However, keep in mind that USB-C is the way that technology is going, so Apple is sort of ahead of the curve in technology here. The 15-inch MacBook Pro, which is the only model worth comparing with the Dell XPS 15, has an IPS display with a resolution of 2880 x 1800 pixels and 220 pixels per inch. At 500 nits, the display is extremely bright, and it supports the P3 color gamut, which is a wide-gamut alternative to sRGB for digital movie projection from the American film industry. Of course, the MacBook Pro is well known for its “Retina” display, offering up one of the most clear and crisp screens within the industry. The Dell XPS 15 9570 has an equally gorgeous 4K display with a maximum brightness of 400 nits and 100 percent coverage of the sRGB color gamut. Dell calls its display technology InfinityEdge, and we have to say that the nearly borderless experience it offers deserves to have a name. You do have to be careful though, as Dell does offer an XPS 15 model with a downgraded display, and that isn’t immediately clear for many. The other thing to keep in mind is that the Dell XPS 15 does have some thicker bezels than the MacBook Pro, though not by much. 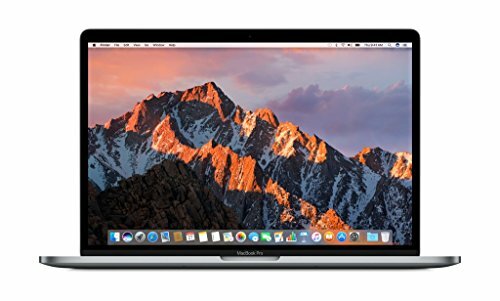 You can get the MacBook Pro with a 2.9 GHz quad-core Intel Core i7 CPU with Turbo Boost up to 3.8 GHz, 512 GB PCIe‑based onboard SSD, Radeon Pro 560 with 4 GB of GDDR5 memory, and 16GB of 2133 MHz LPDDR3 onboard memory. 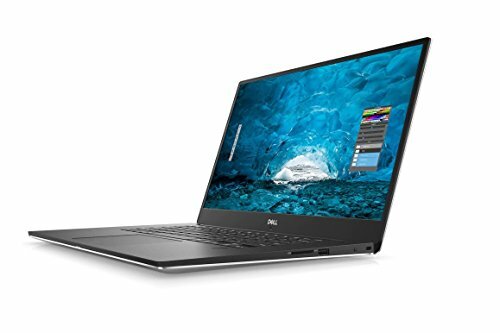 The Dell XPS 15 9570 comes with an 8th generation Intel Core i7 CPU clocked at 2.2 GHz with Turbo Boost up to 4.1 GHz, 32 GB Dual Channel DDR4-2666MHz, 1 TB M.2 2280 PCIe Solid State Drive, and the Nvidia GTX 1050Ti with 4 GB of GDDR5 memory. While the performance of the Intel CPU inside the MacBook Pro is comparable to the performance of the 8th gen Intel CPU inside the XPS 15, the NVIDIA GTX 1050Ti is substantially better than the Radeon Pro 560. On average, it achieves nearly 80 percent better benchmark scores, which translates into faster video rendering times and less time spent waiting for video preview to load. On top of that, Apple doesn’t do very well as far as value for price goes. The hardware found in the MacBook Pro 15 can be found fairly cheap over on a Windows 10 machine. You can actually get a lot better hardware in the XPS 15 for less than a MacBook Pro. It’s worth noting that the MacBook Pro 15 just doesn’t age well. The hardware you get inside cannot be upgraded, so you’re pretty much going to be looking at buying a new MacBook Pro every few years in order to stay on top of the new hardware and technology coming out. The Dell XPS 15, however, has some areas that you can upgrade, so long as you know how to take apart the laptop and put it back together. You can upgrade RAM, the video card, and even your storage. The only thing not upgrade-able is the processor itself. For most people, the choice between the MacBook Pro and the Dell XPS 15 9570 will boil down to the operating system. But if you’re happy with both macOS and Windows, you should decide carefully whether you’re willing to pay extra for Apple’s design and build quality, especially considering that the XPS 15, which is substantially more powerful than the MacBook Pro, also looks pretty good. Not only that, but the Dell XPS 15 can be upgraded much easier, keeping things pretty modular for when you need to expand storage or need more RAM.